The women of the Tudor court have some of the most amazing stories but they are often overshadowed by their husbands, fathers and brothers. Anne Knollys is not someone we often read about, but her story and the story of her descendants is one that needs to be told. 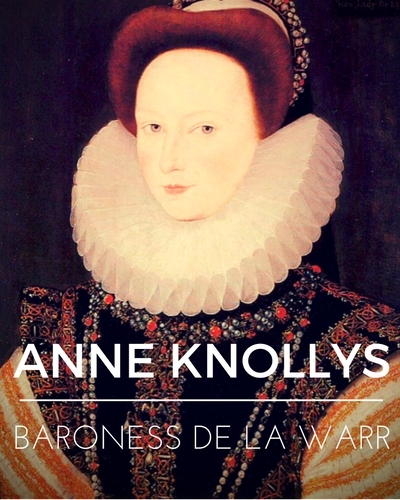 Anne Knollys was born on the 19th of July 1555 to Sir Francis Knollys and Lady Catherine Carey. If you believe the rumors that Catherine Carey was the illegitimate daughter of Henry VIII and Mary Boleyn, it would make Anne the late King’s granddaughter. Regardless, she was related to Queen Elizabeth and sister to Lettice Knollys. On the 19th of November 1571, at the age of sixteen, Anne Knollys married Thomas West. Thomas was the eldest son of William West, 1st Baron De La Warr, by his first wife, Elizabeth Strange. He would eventually inherit the title Baron De La Warr in 1595 and hold it until his death in 1602. Anne and Thomas had thirteen children together. It is through these children that their legacy is made. Francis West traveled to the new colony of Virginia in 1608 as a Captain, returned again in 1610 and served as Deputy Governor of Virginia from 17 November 1627 to 5 March 1629. The De La Warr family would eventually be responsible for the name Delaware for one of the orignal thirteen colonies. The colony took its name from Thomas West, 3rd Baron De La Warr – the son of Anne Knollys. Through her children Anne’s legacy lives on. We might not know about her but early American history marks the achievements of her sons. In turn we learn about her while researching them. So interesting! Had no idea how the name Delaware came to be and how the children were so involved here in the colonies. I do think I have this name in my tree and I am excited to do more digging now. I knew Mary Carey had more than child by Kind Henry but I never read anything about them or what happened to them. This most interesting and I too never knew the origin of Delaware. I had read that Queen Elizabeth tired to generous to her Mary’s children but I never knew how. Thanks for the information and look forward to more interesting facts. You must exciting to find out so much information all at once. My family are descendants of Queen Isabella and have the tranced the first one that set foot in the New World in the 1500 hundreds. We have all those related here and not through the internet but through 45 years of visiting churches, and record places and this year the last aunt of the pure Spanish line passed away. We hope to open a museum of records and pictures and antiques in Texas. I hope to spend time in Spain and continue my search to those still living in Spain. All I have is the name of cousin and his family connects in court of the Queen who is our ancestor who came because the Queen was trying to populate the Americas. I have a question about those of lineage of the Tudors. I have seen people with the last name Tudor every once in a while. Are they in anyway related or did they just pick the name and are not of the lineage? Tudor is not a common last name. Anne Knollys West is my 11th great grandmother. 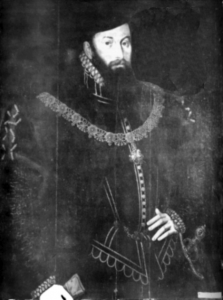 Ancestry’s We’re Related app shows her father as Sir Robert Dudley First Earl of Leiscester. I’m finding that Anne was Lettice’s sister, but find tracing these roots is maddening…lol. Lady Anne Knollys is my 14th great grandmother. Mary Boleyn 16th. Found this while doing my tree. I’m a West descendant, would love to connect with others who have done their genealogy and DNA. I’ve done both and am willing to trade info. West descendant here too… among others. I have my dna kit number on GEDMATCH. My Kit # is A964102. Haplogroup R1b-L2 — G2 and J2 Markers.